Explore the Seafloor joined English Heritage’s event “From Caves to Cohorts” at Fort Cumberland on the 31st of July and 1st of August, part of the Festival of British Archaeology celebrations. The weekend was great fun, exploring Britain’s history from the Stone Age through to the Romans with exhibitors and great hands-on activities to fill the whole day. 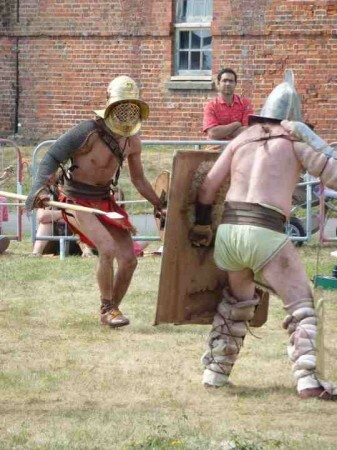 One of the highlights was the Roman re-enactors Britannia who entertained the crowd with a rather gory Roman gladiator training session. Located in the Maritime tent Explore the Seafloor joined the New Forest National Park Authority’s Maritime Archaeologist and English Heritage’s own maritime specialists giving people the opportunity to discover the amazing history of Britain’s seas. Explore the Seafloor would also like to thank Wessex Archaeology staff Amy Radford and Sophie Thorogood for coming along and helping out on the day. This project is brought to you by Wessex Archaeology on behalf of the Marine Aggregate Levy Sustainability Fund.